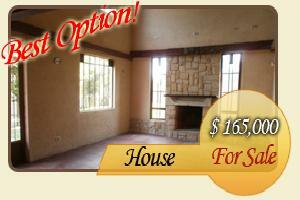 This house is located in a gated community with fantastic green áreas, playgrounds and clubhouse. The plot of this house is large than most in the complex, it has an 8 meter front and it is 26 meters deep. It is one storey with a living room with a fire place, dining room , and kithen with cabinets, 2 bedrooms with closets, one with a walk in closet.